musical instrument has been proven in scientific studies to cure apnea. So what exactly is a didgeridoo, and how does it relate to sleep apnea? Good question! Read on to learn more. What the Heck is a Didgeridoo? While the origin of the name “didgeridoo” is not clear, most experts agree that the instrument came from aboriginal tribes in Australia. Although originally from Australia, didgeridoos have made their way around the world, and their soothing sounds can be heard in songs globally. Authentic didgeridoos are made from hardwood trees such as eucalyptus or bamboo, and are hollowed out naturally by termites. (Yep, termites!) They’re made by cutting a hollowed out tree into sections of about 3 – 8 feet. Okay, so what does all of this have to do with sleep apnea? In aword: breathing. People of western cultures are primarily “chest breathers”. In other words, we take a lot of short breaths, instead of breathing deeply from the belly. Didgeridoo therapy can cure sleep apnea because of how it affects your breathing. In other words, by playing the didgeridoo, you change the way you breathe. Remember that sleep apnea is typically caused when your throat/airway collapses while sleeping. Playing a didgeridoo strengthens the airway by changing the way you breathe. Think about the tissue in your airway like any other part of your body. Exercise not only firms and tones muscles but reduces excess tissue (fat). It is this excess tissue that causes obstructive apnea in the first place. Playing the didgeridoo promotes deep breathing, and also puts you into a more relaxed state of mind – so its health benefits go way beyond just apnea. People who have heard the eerie and mellow sounds of a didgeridoo describe it as calming. And speaking of music, the popular musician Yanni has a member of his band who plays a didgeridoo. If you have listened to a Yanni CD, you might be familiar with the sounds of a didgeridoo. I hope you enjoyed today’s lesson, and I hope this e-course is opening your eyes to the many apnea treatment possibilities. More lessons are on the way. If you would like to take action to cure your sleep apnea *right now* I encourage you to download my e-book called “Cure Your Sleep Apnea without CPAP: 9 Survivors Tell Their Story“. Click here to learn more. 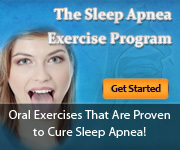 alternative sleep apnea treatments. It also has 12 “action steps” for each treatment, so you know exactly how to take action. My book is *only* for sleep apnea sufferers who would like to take their health into their own hands. If that’s you, I encourage you to act now. Lesson #2: Tell Your Sleep Apnea to Stick It!